Most Mac-using web developers probably know by now that an awesome way to test work locally is with Python’s SimpleHTTPServer module, which launches a lightweight web server in the current directory. I wanted to take this a step further by adding a custom service that allows users to right-click any directory in Finder and launch both a server and a browser pointing to it. 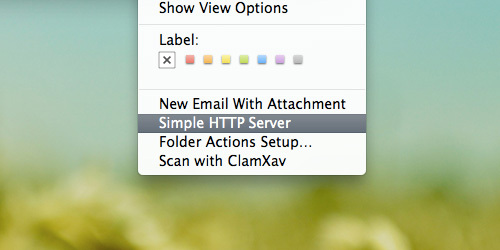 I did this by creating a Service in Automator with a custom AppleScript action. set serverPort to do shell script "PORT=8000; while lsof -i :$PORT > /dev/null; do ((PORT++)) ; done ; echo $PORT"
The complete service is available for immediate use or for editing in within Automator.